Not only did World War I reshape how modern wars would be fought, the conflict had an enormous effect on society as a whole across the globe. 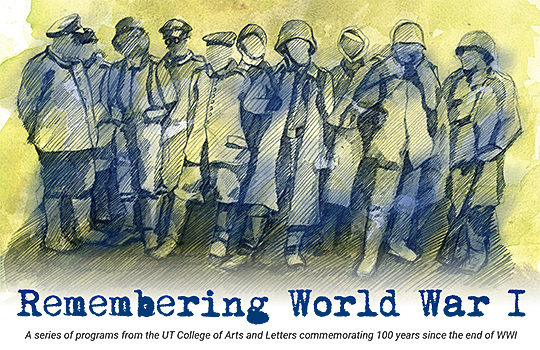 Rizk is co-organizing a UT symposium titled “Memories of World War I,” which will be held Friday, Nov. 9, from 9 a.m. to 5 p.m. in Carlson Library Room 1005. The symposium, one of several upcoming events at UT commemorating the 100th anniversary of the Nov. 11 armistice that effectively ended the war, will bring together a diverse collection of University and community scholars to discuss the effects of the war and its cultural representations in the United States and elsewhere. Topics to be examined include the war’s effects and consequences on northwest Ohio and U.S. politics; the cultural memory of the war in the U.S. and abroad; how the war shaped national identities; and the innovations in art, music, literature and theater that were triggered by World War I. Of particular note is the focus on the experiences of women during World War I.
Dr. Friederike Emonds, associate professor of German and a symposium co-organizer, said much of our contemporary understanding of the war comes from the well-known male writers of the so-called Lost Generation, while women’s war literature of the time has been overlooked. “As women were not allowed to join the military and fight at the front, women’s war experiences offer a different perspective on the war, allowing us new insights and perceptions that significantly contribute to our efforts to gain a more comprehensive understanding of World War I today,” Emonds said. • The University of Toledo Department of Theatre and Film is presenting an adaptation of Erich Maria Remarque’s novel “All Quiet on the Western Front.” Written and directed by Dr. Matt Foss, UT assistant professor of theatre, the play will be performed Friday, Saturday and Sunday, Nov. 9-11, in the Center for Performing Arts Center Theatre. Tickets are $10 for students; $12 for UT faculty, staff and alumni, and military members and seniors; and $18 for the general public. Call 419.530.ARTS (2787) or order online at UToledo Ticket Sales. Tickets also will be available at the door. • A free screening of an English film adaptation of “All Quiet on the Western Front” will be held Wednesday, Nov. 14, at 4 p.m. in Carlson Library Room 1005. • Through Friday, Dec. 14, Carlson Library also is displaying World War I artifacts and photographs from the collections of Richard Oliver and the Ward M. Canaday Center for Special Collections. The free exhibit is located in the library’s main lobby. For more information on UT’s Word War I centennial events, to register for the symposium or to purchase tickets for the theater adaptation of “All Quiet on the Western Front,” visit the Roger Ray Institute for the Humanities website. This entry was posted on Thursday, November 8th, 2018 at 3:11 am and is filed under Arts and Letters, Events, Library, News, UToday .